Who hasn’t had a day that seemed to last forever? One of those days that drags on and on, then suddenly the day is done and there are still things on the “To Do” list. Our reading today from St. Paul reminds us that God’s time is not the same as ours, and that we would be wise to use our time to prepare for the day when Christ returns to us. When I was growing up, Advent was a season of high energy, long lists, and days that seemed to stretch out forever. There was so much to do! And no matter how much you did, Christmas seemed to stay just out of reach. And the meals! My Mom was from Scotland, so we made shortbread cookies with rice flour, steamed puddings with currants, and there was always a wee nip of Drambuie to usher in the holiday. Occasionally we’d have smokies or smoked haddock. Here’s a tip – if you try to cook them at home, open the window first! 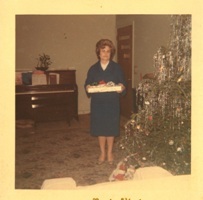 It seemed that my mom always had one more thing we had to do before we could relax and enjoy the holiday. When Christmas Eve finally arrived, our work was done and we would go to church. We didn’t just go to our church (Presbyterian), we went to Catholic, Moravian and Methodist services. This was when we could rest as we listened to the Christmas story from the various faith traditions. It seems like Mom had a great plan for us after all. During this season of waiting and preparation, what/who are we waiting for in our lives? A new baby? Or maybe waiting for the pain and darkness of loss to lift and be replaced with a day of hope and brightness? Instead of wishing away the days, take some time to make a plan for your personal faith journey so that when the day finally arrives, you can rest as God’s plan unfolds for you.